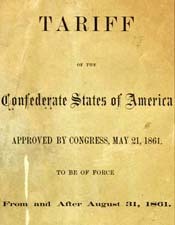 Confederate States of America Tariff of the Confederate States of America: Approved by Congress, May 21, 1861: To be of Force From and After August 31, 1861. Tariff of the Confederate States of America: Approved by Congress, May 21, 1861: To be of Force From and After August 31, 1861. Charleston: Steam-Power presses of Evans & Cogswell, 1861. Tariff -- Law and legislation -- Confederate States of America.